Autodesk Sketchbook is probably the most realistic drawing app available for iPad users. The tool has a natural drawing feel with plenty of brushes and customization options, making it a top choice among illustrators. The “ink” even has a natural feel and colors mix and pressure shapes elements in just the way you would expect. 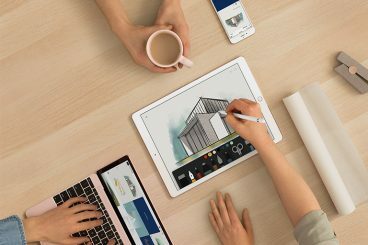 For users that use the software of the same name on other devices, the iPad app syncs with other devices so that you can move drawings from one place to another with ease. Comp CC is the first of a pair of Adobe apps on this list. Comp is designed to let you lay out an actual idea on your iPad using actual assets from your library. Then you can send that wireframe to other Adobe applications. The iPad app uses touch-based movements for aligning, grouping and other actions. This can take a little getting used to but works pretty well. You can also use the Apple Pencil for even more control and ease of use. The best part of this wireframing and digital tool for your tablet is that it feels natural, almost like sketching in a notebook, but is portable and you can take it – and keep adding to it – from anywhere. While Comp is made for web and app design, Adobe Capture CC is made for designers that want to turn photos into vector graphics or to add elements to make all new creations. The Capture CC app is a mashup of the brush, color, hue and shape tools so that you can add patterns or color to images, play with custom brushes and styles and even smooth images. Once you are done, you can export everything to a vector format for use in projects. For Adobe Creative Cloud users, everything you create in the app will sync with your libraries for use across devices. Paper by FiftyThree was one of the first drawing apps with a pencil and is still a strong option for illustrations. You know Procreate has something right: It is an Apple Design Award winner and App Store Essential. This paid app has more robust features than some of the other free options including a high canvas resolution, 136 brushes, an advanced layer system, and is powered by Silica M: the fastest 64-bit painting engine on iOS. One of the things designers and illustrators love about it is the dual texture brushes and responsive smudge tool. It really is almost like drawing on paper or a canvas. Plus, everything in Procreate is made with a super high resolution. You can print illustrations from Procreate on massive canvases without losing any quality or detail. And did we mention that it works with video, too? You can even record and stream as you create an illustration. IfontMaker allows designers and typographers to create a custom typeface right on their iPad. According to the app, you can create a handmade typeface is less than 5 minutes. Any font you create in the app can be exported and used on your computer or other devices and you can embed it online royalty-free (because it is your creation). You can start drawing using the guides on screen with your finger, Apple Pencil or stylus and even adjust curves and lines with Bezier handles. The pen mode also allows you to draw in vector shapes. Even if you never plan to launch your own typeface in projects, it is a lot of fun to play with to see what you can create. Evernote is an all-in-one productivity, notetaking and sketching tool. It’s like a digital notebook with folders where you can store anything and create new pages as well. Everything in your Evernote account syncs between devices and can be a great place to start projects by saving ideas for a mood board or sketches or wireframes. You can add photos and scan documents on the god so that everything is in one place. One of the best features might be that you can markup files and documents, adding notes or sketches to any files you’ve already saved. Plus, you can email and share right from the app. Astropad helps turn your iPad into a graphics machine. This is the most expensive paid tool on the list but is packed with features for those who are doing a lot of iPad-based illustration. It’s got stellar ratings – 4.5 stars with more than 1,200 reviews in the iTunes store – but does require that you have a Mac computer. It works by allowing you to use an Apple Pencil or stylus to draw on the iPad and which move that design right to your desktop computer. You can see exactly what you are drawing with mirror images on both screens, unlike those pads that leave a lot to the imagination. Astropad works with any app on your Mac computer and syncs via Wi-Fi or USB. The app is pressure sensitive, works with a variety of drawing tools and everything you create is in a high-resolution format. For illustrators that want to create digitally with the look and feel of doing it by hand, this app is a great solution.